The Tatra isn’t the character, I just liked him. 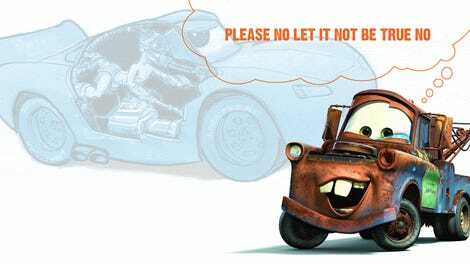 You may recall that I confronted the brains behind Pixar’s Cars franchise about the difficult conceptual issues inherent in the Cars universe. That was a partial success. Now, I’d like to show you a conversation I had with the people behind the visual look of Cars 3. It’s a bit more fun, and a bit less disturbing. I talked with three of Pixar’s talented artists, Jude Brownbill (Directing Animator), Jay Shuster (Production Designer), and the wonderfully-named Michael Comet (Characters Supervisor). Together, they’re responsible for the way the Cars universe looks, and they decide all of the visual rules that govern that universe. I’ve accepted that Pixar will never accept my fervent belief that car eyes are headlights; I’ve made my peace with that, and accept they have their reasons. The therapy helps, as do the pills. Even so, I still challenged them to try to Cars-thropomorphize a car with a very prominent natural face, and they gave it a very good go. We also discussed the nature of trunks in the Cars universe (can they open?) and whether a car’s body panels can ever be used as a mouth. 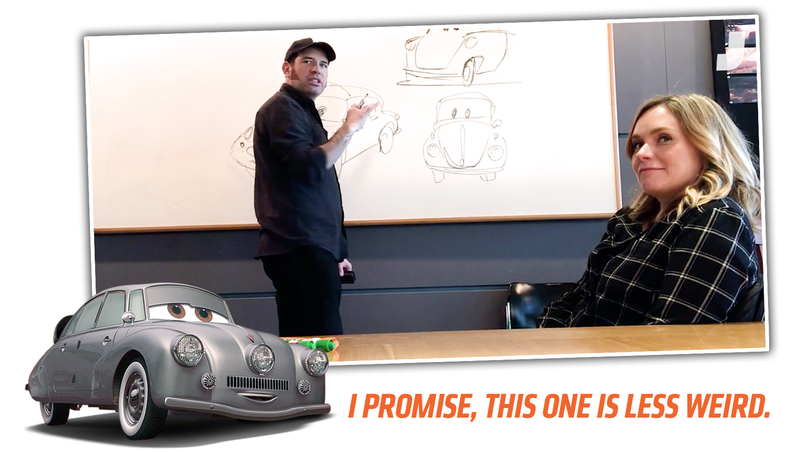 The biggest treat was that Jay was willing to do the Cars-treatment on a car that has yet to actually be in any of the movies, and it was great seeing a talented artist quickly sketch out a new, never-before-seen character right there on the whiteboard. We didn’t give it a name, yet, though, so feel free to come up with one and a backstory in the comments.